Yes, I am still out here! On to the sewing/crafting front: the quilt for Christmas Traditions was finished with pillow shams (we did get our minimum bid on the quilt of $150). I taught my quilt class, it was a hit with 9 students. The students asked to have another class after the new year. That makes it a hit right! After trying to auction my services at Christmas Traditions and having no one sign up for a class at the LQS it felt good. Two Christmas presents are handmade this year. My boss left back in October. Here is the quick quilt made from the leftovers of the quilt class quilt. The fabric is called “Kashmir”. The 3 yards of fabric could not make a larger quilt if used as a border and what else do you do with all the cool border prints. The fabric was cut into 1.5 yards sections. The section with the small green rectangles on the edges is the middle. I started in the middle and “stitched and flipped” my way to the outside edges in a quilt as you go method. The quilt was started on Thursday and gifted the quilt on Sunday afternoon. It was right up her style. The binding was all put on by machine. I have had problems getting comments to post. DH upgraded the main computer, is that part of the problem?? I will have to try from my laptop. I do keep up on blogs. I have been trying not to sit in front of the computer so much. We moved wood from the pile at the end of the yard today. We are trying to get the yard ready for the winter. We have a hard time moving the tractor in the snow. It isn’t that it doesn’t want to move, it just wants to slide on the snow right toward the water. So, we moved it today, now I can have a fire on the next cold day. The fireplace is cleaned out and I have wood. I gave a little teaser of fabric sitting on the cutting board. This is the quilt I’m teaching next month. I wanted to get the top done. It turned out well. The outside is a border print. The pattern was free from a LQS with the purchase 5-1yd cuts of fabric. The pattern and fabric have been sitting in my stash for a about 1 year. I changed one of the cuts from my original purchase of a dark orange mottled to the green & black print on the recommendation of Lola. I also had enough fabric to add an additional row of blocks…it needed to be slightly larger. Since it was a border print, I purchased more than the 1 yard cut. I did not want to run out. There still was not have enough to miter the corners, oh well. I think it still turned out nice. I still need to cut the binding. Well, I am off to work on a project for my niece. I hope to show you pics next week. I often loose track of time while I am on line surfing. Looking at quilt patterns, quilting blogs, fabric stores, etc. I am sure that you all know what I am talking about. I wanted to get more done in life. Utilize the time I had better. I have actually not always kept up on blogs. I have had to play catch up at times and re-read items that I skimmed over before. What have I been doing………SEWING! Here is the pic of the Christmas Traditions Quilt for the church. I need to quilt it yet. I certainly had help from the other church quilt ladies. The poinsettia print is leftovers from the soldier stockings made last year. The other fabrics came out of my stash. After I finished getting the Christmas Traditions Quilt layered up, I picked up an older project. This other project had been my “leaders and enders” project. I worked on it quite a bit at retreat back in March. This is fabric my husband brought back from his business trip to Nebraska. I made a couple wrong cuts with the Turning Twenty Simply Sashed pattern. A few clicks of the mouse and the replacement fabric was in transit. I could not find that fabric at any of the LQS. My version has all 4 corners the same raspberry color, thanks to my ooops (along with almost 1 yard of fabric for the stash). The fabric is “Rock Candy” by Mark H. (I can’t remember how to spell his last name.) His most notable fabric line is “Fairy Frost”. This “Rock Candy” line also has the metallic sheen “Fairy Frost” is know for. Now to my current project….I WILL be teaching a class in November. I need to finish up the sample in the next few days. Here is the stack of goodies. The alternating block is done. I just have to sew the stack of cut fabric. There is a seam on each sides of the piece you see there, then the blocks are all done. Hope to see you all in blogland. We have returned from our latest adventure. The girls returned to school on Tuesday last week. I took Thursday to relax and have the ladies over for breakfast. We joined DH on his business trip. We enjoyed the day at Niagara Falls. This is a view of the “American Falls”. This set of falls is on the US side. The pics are taken from the Canadian side. The observation deck is in the same location as the old border bridge that was taken off its foundation from an ice jam, many years ago. This is the official “Niagara Falls”. Water from these falls is from 4 of the Great Lakes. The mist from the falls is so big that you can see it from miles away. If you enlarge this photo you will see the boat on the right side. This is a fairly large boat, holds a couple hundred people and is 2 stories high. We went on the boat. We were given rain jackets to wear. MJJR decided to not were the hood, her hair was completely drenched. The amount of water and the quickness of it coming was unbelievable. At night, the locals turn down the spigot and capture the energy for electricity. We enjoyed the day with some new friends. Another family from the same training DH was attending came to the falls with us. The family is from Spain. The 5 of us girls had a great time while the DH’s had training. We did some back to school shopping. We also found a great museum. This children’s museum has a wonderful butterfly garden. They have both an indoor and outdoor garden. Not only did they have awesome butterflies, they also had a hatching center. There was 2 big windows full of chrysalis’. This looks creepy at first. Butterflies are drying their wings and you can see some are moving trying to get out. Now that things are getting back to normal (Yeah, right! Our well went out today and we are expecting a hotel visit for a couple days unless the fix is easier than expected), I am hoping to work on the dahlia quilt. I am still avoiding the work. I have done some extra cleaning, knitting and anything else to avoid the quilt. I wanted to show a little about the seminar that came to town. I really learned how to quilt from watching Alex Anderson and stopping by the LQS and talking to a seamstress that would hold classes periodically. She would conduct business in the shop but doesn’t work in the LQS. So to have Alex Anderson come to town was BIG for me. I had made a Convergence Quilt by converting a Ricky Tims’ pattern for my dad. I loved how fast it went together. Mine was throw size and had 4 fabrics. Libby Lehman…didn’t know much about her before going into the seminar…just that she was a machine quilter. It was soo cool to see some of the quilts that we see around. I sat right in front of this Lonestar quilt. It was neat to look at this quilt over the 3 day seminar. Ricky and his father made this quilt together. The Rhapsody quilt was also up front. I love how such a bright red is the neutral color is this quilt. Ricky also mentioned how 10 spools of thread was not enough to machine applique down of the pieces. I also love the way Libby has moved from her thread play to the color variations and reverse applique of her more current quilts. These quilts are generally simple piecing. She will draw a line and then stitch and cut out the outside or the inside. She then will satin stitch around the raw edge to cover it up. This is done before the layering. She uses a LOT of stabilizer. This Dahlia, as I stated before is from a long time ago. The top was the greatest colors, back in the day. Now I still like the design and I do like the colors, but I don’t have any drive to finish this quilt. I have taken this quilt to retreat so many times. It is a standing joke just to ask if it is done. I might actually have it done by the time retreat rolls around. I don’t think this will make the monthly goal. 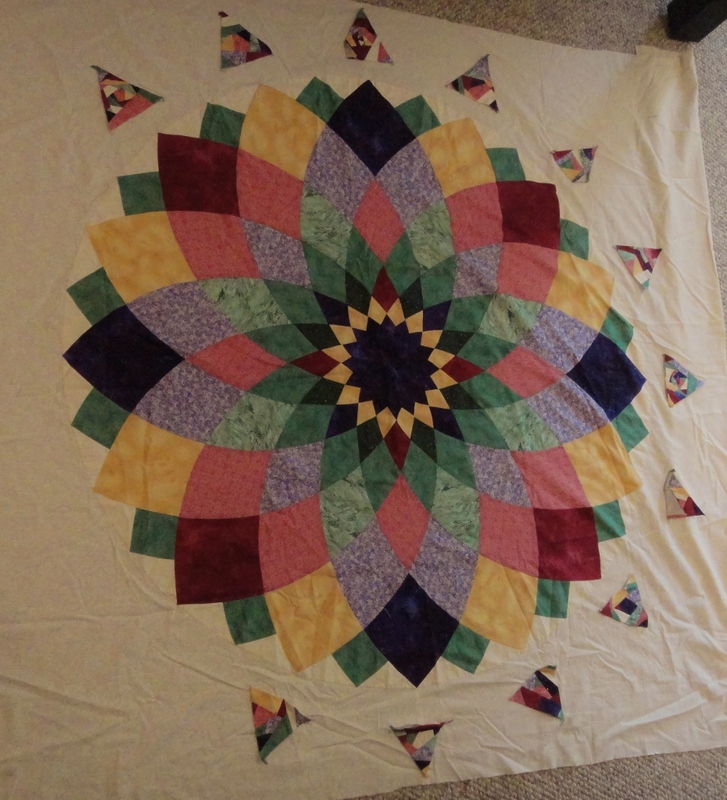 The quilt needs to have the outside triangles put on it and a large green border (this is where I thought some gentle Ricky Tims’ curves) sewn on. A back needs to be found, layered and quilting completed. The girls go back to school this month, but we have one more traveling adventure before that happens. I will be excited if the quilting is underway. I have been working on the small “crazy” triangles for about 2 years. I hate this technique, I only have 4 left to go. I am so glad that this quilt will have a whole month dedicated to it. On another note, this is fabric that DH brought me back from Nebraska last fall. The design is in one of the newer Turning Twenty books. I have been using this as a leader and ender project for the last 6 months. It is starting to shape up. Here is also the knitting project that I have been working on. It is the standard “dishcloth” pattern…yo after 1st and knit to the end, turn and repeat. I think that I may want it to be larger. I am out of yarn. I may see if I can find some, but think that I will start a new project or pull out the celtic knot (applique) for the trip. I just need to make a decision. I borrowed the knitting needles. I know that I shouldn't have problems traveling with them, but am not sure that I want to take the chance. I can’t believe it was 2 weeks ago that I was sitting watching Alex Anderson, Ricky Tims and Libby Lehman. I will get the pics of the seminar up soon. DH has been traveling for work. He was gone during the week of the seminar. The girls had a couple of long days, while I was at the seminar and Dad was out of town. We had 2 days together before the family all went different ways. Lola went to Journalism camp (south) for 3 days, DH headed off for more training (west) and MJJR and I headed off to visit with family and hang out at the beach on Lake Michigan (east). We all returned home Thursday night. 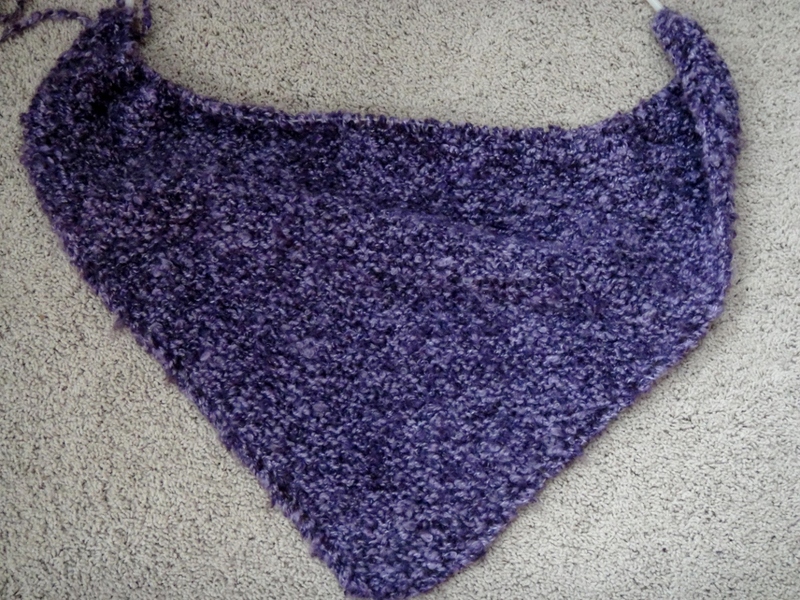 I managed to get some time and finished the July UFO done late Sunday night. I still might put another brown strip around the outside. I can’t wait to work on the next UFO. For August, the UFO is #7. This is my Dahlia quilt. The top is one that has gentle curves. I took the class before I was ready to try curves. I finished the dahlia several years ago. I find it funny that this quilt was chosen at this time. I struggle to find excitement in this quilt. It is a lovely top. It has very little left to finish the top. After watching how Ricky Tims’ achieves his gentle curves, I thought during the seminar that my dahlia quilt might accept this technique quite well. Now this quilt has been drawn for finishing, and so close to learning the technique and dreaming of the techniques on this quilt. I believe that it is the way it was meant to be. . . this quilt couldn’t have been drawn until I learned the technique. I don't have any pics of the dahlia quilt. I will get some soon. Boy are the knitting ladies going to be excited to hear that my socks I started back in October are the UFO of the month. I can't wait to show them a finished project. It has been very chaotic here this month. We have had car accidents, boss' retire unexpectedly, extra hours at work and a venture or two into the basement with tornado warnings. I watched a neighbor child the other night. We made a quick quilt. It turned out so cute. I am hoping to get some pics. I hoping to have more time next month to write. I have been lurking and keeping on all the blogs. My big news is that I have lost 12 lbs. with weight watchers. Here it is. I decided to stay up late. Sew lots and do not much else for the last 2 days. I did take a break to mow the lawn, do laundry and attend a choir concert. It has lots of strings that need to be trimmed and binding that needs tacking. I am also not thoroughly impressed with my quilting in the orange border. I like the concept, but, Lola thinks it looks like toes. She has some strange feet phobia. I am patiently waiting to find out what the May UFO Challenge is. Lola would really like it if I went back and finished January’s UFO, the dreaded Alaskan Christmas Quilt. Can you say problems? It is the “lets have the fabric bleed all over everything quilt”. I am hoping for #8….Christmas Table Runner. This would be a quick one and it would give me time to paint the inside of the house before the girls finish school for the year. Here’s to a few days of not quilting….the family would like to spend some time with me. I would love to hear from you mom’s out there. What would you like for Mother’s Day? I am thinking of a few things for mine. I am always open to creative ideas. I also am having a hard time answering that question for my own daughters. It was suggested that I get the gift of the family straightening my sew room—NOOOOOOO! Lola also has a little OCD about organization. I find this funny when I open her dresser drawers. I have done some work on the April UFO. I certainly can’t believe that I will finish it before the end of the month. I still have lots of work. I am looking forward to the month when an almost done quilt is chosen. Life did some getting in the way of the quilting. DH spent some time in Tokyo, I joined Weight Watchers, and I picked up some extra time at work. You can see I have a few more rows of applique to sew down. This quilt is going much slower than I thought that it would. It is irritating how much I have to scrunch the quilt and make it fit under the machine. You can see the close up of the flowers. I have to make the red inside of all the flowers. The prints that came home from Japan are border prints. All but one of the prints have the border on both ends of the print. I love the variety of the prints and can’t believe the beautiful colors. When DH said he found me some fabric, this was not what I was expecting. The “store” was just a street vendor. I am looking forward to working with them. I thought I would just give a quick update. DH returned last week Wednesday from Japan. He went through about 5 earthquakes. He is fine. He returned with fabric. I will get some pics and show later. Today is my only day with no girls and no work this week. He also brought home some Saki, chopsticks and Chai tea for me. I went to Weight Watchers today. Last week I was down 7.5 lbs. This week 2.5 lbs. I am so excited. I just would be happy to make it through this week and stay even. The key for the week: Plan ahead. Decide when to use your points for the week BEFORE you get to Easter dinner. I will weigh in again on Monday after Easter. That is a little scary. We ended up at the Bull vs. Pacers play-off game on Saturday. What a great game. I hope they can pull off another win tonight. We got to see friends in Chicago while we were there. What a great surprise that was. Better get quilting. I only have an hour left before the girls arrive home. 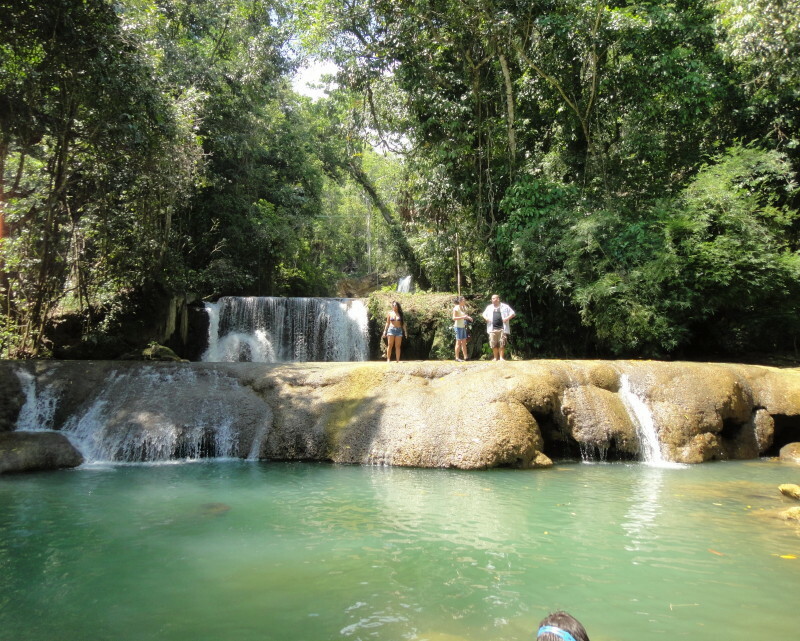 We flew down on St. Patrick’s Day to the island paradise of Jamaica, Mon. We decided to ask some neighbors if they were interested in going. So 4 adults and 4 kids headed off. We had adjoining rooms. We had a little surprise…they upgraded our room. (This was our 4th trip to the island.) The kids enjoyed making a crocodile….then a few days later we saw a few more. The real crocs were very docile. The locals must feed them some because the crocs would let the workers actually touch them. We all thought them as a little crazy. The Jamaican’s aren’t known for great roads and more than a few of us got sick on the road to see the crocs. The crocs are located in the brack or brae water (half salt/half fresh water) of the Black River. We visited the YS Falls just north of the crocs. You can walk up into the falls. There is zip-lines that fly up over the falls. We only got to spend about 1 hour here. Next time we will try to spend the whole day there. The next place we headed off to was the Appleton Rum Factory. We have been fans of the Appleton Rum for years. This distillery has been making rum since 1749. Many of the old ways are still in practice. This is also the only woman senior rum blender in the world. The view from the room is gorgeous and I can’t wait to go back. I must say, besides the humor and events of our own group this was our least eventful trip in a long time. We always seem to find eventful situations or it finding us (people lost at sea, fires closing roads, social uprisings, police shootings and famous people showing up). My socks are coming along well after lots of airport/airplane time. I also read 2 almost 3 books. I wrote this up just before DH left for Tokyo. I finally had some time to gather up the photos. Things are going pretty good. I did sign up for Weight Watchers on Thursday before the "Are you sitting down?" call. I am doing pretty good considering. I have taken off most of the Jamiaca weight. My worst time is after the girls go to bed. On Thursday about 4:30pm my husband called my cell phone asked if I was sitting down. I mentioned that I was driving and his comment was “good you are sitting down”. He said that his work asked him to go to Tokyo. He left about an hour ago for the airport, less than 48 hours after the initial conversation. His return ticket is for 2 weeks from now. However, the exact length of his trip is unknown. His work decided that he might have knowledge to help with the earthquake disaster cleanup. He is not excited about going but also thinks that he may be able to help. He has traveled for work before. It was always inside of the US and often for advanced training. We have been making calls and getting him packed. We sent water in his suitcase and forks/spoons (so at least he can eat with them in his room). I have encouraged my girls to eat with chopsticks when we have oriental food, he never does. Us girls will be just fine, and he will be also. It just reminds us all how small the world really is and how things can change so quickly. As most of you know.....I finished my March UFO!!!! Here is the pic. I finished quilting and sewed on binding at Retreat at the beginning of the month. The binding is now finished and strings are all trimmed. The April UFO is my stacked coins top that needs to be quilted. I will have to dig it out to get pics. You can see others finished projects at The Patchwork Times. Life here is a little crazy. When it settles down in a couple days I will fill you all in. Keep our family in your prayers. Last year at retreat I fell in love with the “Two Hour Purse” that many of the participants had. The purse was made at the previous retreat that I hadn’t been able to attend. I looked for the pattern and finally found it. I made mine this retreat. I quite a bit enjoyed the bag as I carried it through Customs going to Jamaica. It was also great when it was time to carry the camera, book and knitting to the beach. Pics of our time in Jamaica will come soon. I did make some adjustments and some mistakes. Do you really think that it is a 2 hour project? This is left over backing from the “KING”. I have managed to get caught up on the blogs and the laundry is going. We arrived home late last night. The camera (new and I don’t know how to run it) battery is dead. I managed to get 1 quick picture off of it (above) before it died again. I am off to do some more laundry and I need to workout….boy do I need to work out. The food was great. The airplane project was my never ending pair of socks. They are getting close. Last weekend I headed out of town. I landed in a small town with a church camp. I did lots of sewing. The March UFO Challenge by Judy L. was completed. I am so excited that I finally finished a project. This quilt is an old leader and ender project. One retreat I made lots of 4 patches. After returning home I started playing with them on the design wall and decided on this pattern. It can be found on Quiltville.com under 16patch & pinwheels. I just was careful with the coloring. The blocks are quilted with baptist fans. The green with a large meandering. The eggplant has just a line through it. This gives me some time to work on the UFO quilts from January and February. More pictures and stories to come. I am taking another week off and will post again later in the month. The snow came again through the night. The sun is now out and the snow is beautiful. Another inch is to come this afternoon. I‘m sure this last stuff won’t stay too long. That inch should make this the snowiest February in our history. I thought that I would show you the socks. I like to take these to the girls appointments. They are coming along nicely. The knitting group gives me a hard time that they are not done yet. They also give me a hard time that I chose the hardest thing to start with. They forget I don't work on these very often. I am waiting for the dishwasher to finish to start the next loaves of bread. I also picked up Bonnie Hunters’ “Scraps & Shirttails”. I ordered it into my local library. I wish I could find one of Judy L.’s books in the library system. I am looking forward to quilting on my Round Robin today. Two design Walls in a Row! I just want to start by thanking you all for the wonderful outpouring of care and consideration last week. I am feeling much better. Things are very rough at work and when my time off is rough too…let’s just say, I am doing better. The girls are off today with President’s Day. Lola decided to go on a shopping spree. With a friend they are traveling an hour to the outlet mall. They have arrived. We gave the girls about 5-6 hours there. MJJR and I are home and cooking. I check out the book Judy L. raves about “Artisan Bread in 5 Minutes a Day”. Here is the first loaf. It isn’t very big. It looks great and smells wonderful. MJJR was wanting to cut into it before it was even out of the oven. MJJR decided to do some of her own cooking. She made no bake Special K squares with Peanut Butter. MJJR has deemed them “good .” (A direct quote). On to the design wall. It looks the same as last week. I did get it put back up, it started to fall back down again. That’s okay. I haven’t been working on this project anyway. I have been quilting on my UFO Challenge Quilt. This is the Round Robin from 2004. If you click you can see some close up of the quilting I have finished. I have 3 more borders to finish. I don’t think that I will finish this before the end of the month. The last border is applique, I figured out the leaves are prepped yet. I am very excited that I am closer that I ever thought that I would be. I am hoping to take this to my sit n sew group on Thursday night and show them my progress. This is the group that created the Round Robins. I haven’t mentioned to any of them I was going to quilt it. I think only 2-3(there is about 9 of them) of the quilts have been finished. I still don’t know what type of binding to use. I may go and purchase something, I have a $5 off a $10 purchase from my LQS. One of these days, Judy L. will pull one of my easier challenge #’s. I did make most of my challenges, a real challenge. I am hoping to catch up on one of the slower months. I also am heading to retreat next month 4 whole days of quilting. If she can pull a good # I might be able to finish at least January’s in addition to March.